I have, in the past, made fun of the modern slider. That is, when a restaurant gets “creative” and “upscale” by miniaturizing something, putting it between bread and serving you three. I even called Georgetown “Slidertown” once because nearly all of its world class restaurants served sliders as examples of their food at last year's Taste of Georgetown. So maybe I don't think the slider is teeming with culinary creativity, but when it comes to home cooking, a slider can be a fun and easy way to eat (and even use up leftovers). I took advantage of this yesterday when I made dinner. 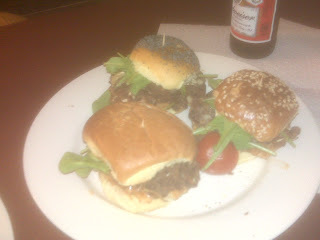 I made three little pork tenderloin sliders for myself and three little black bean burger sliders for Julia. The burgers I made by combining half a can of drained and rinsed black beans and a quarter cup of black bean & garlic dip that I got fresh from the Crystal City farmer's market. I then added a large pinch of shredded white cabbage, a tiny pinch of salt, black pepper, juice of half a lemon, a pinch of sugar and a couple little bits of brie cheese to give it richness and depth. I mashed this all together so it was all combined and roughly chopped. I then lightly sprayed a baking sheet and “pattied” up the burgers into small 2-to-3-inch-wide disks and placed them on the sheet. I then put them in the oven at 350 degrees for 15 minutes at which point I put a little bit more brie on top of each one and left them in for an additional five minutes to allow the cheese to melt. When they were done, they were a little crispy on the outside, with a nice bubbly layer of cheese on top. I let them cool for just a few minutes so they weren't falling apart and actually “stood up” like a burger. While the patties were in the oven, I made a little slaw for the bottom of the sliders to add a little crunch, moisture and zip to both of our sliders. I mixed about a cup of shredded white cabbage with a couple tablespoons of light mayonnaise and half a cup of barbecue sauce. I also added some chopped Mediterranean green olives for a little saltiness and further tang, and a tablespoon of extra virgin olive oil. I mixed the slaw with a fork until all of the cabbage was well coated. Finally, I put the sliders together. I laid out three lightly toasted mini burger buns on each of our plates. To each, I added a little pile of slaw on the bottom. For Julia, I added one patty on top of the slaw on each bun. For mine, I took three thick slices of leftover roasted pork tenderloin from the night before and added one on top of the slaw on each of the buns on my plate. I finished each of the six sliders with some arugula and a couple slices of Campari tomatoes. 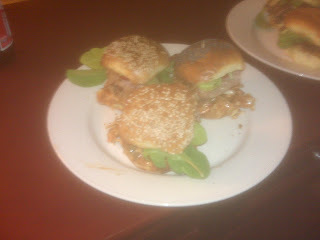 The sliders were very attractive-looking – and not too messy considering I piled them a bit high. I thought the pork with the slaw was a perfect combination, adding some much-needed crunch and spicy, tang to the sandwich. I only tried a little of Julia's, but the meld of flavors was deep and very enjoyable. She was thrilled at how they tasted – but she was even more wowed at the surprise of a little plate of sliders for dinner. Maybe those Georgetown restaurants are on to something after all.